Past guests of Uniworld, Trafalgar, CostSaver, Insight, Luxury Gold, African Travel, Brendan and Contiki save an additional $100 to $200 per person off this trip. Click here for eligible departures. The Main-Danube canal is a masterwork of engineering: It allows ships of all shapes and sizes to cruise from the Black Sea all the way to the North Sea, through no fewer than 15 countries. Sixteen locks punctuate the 106-mile (160-kilometer) stretch between Kelheim and Bamberg, linking the Rhine, Main and Danube rivers. Building the canal was no small task, especially considering changes of altitude (each river is different); the locks gently lift and lower the ships an astonishing 1,332 feet (406 meters) over the continental divide. Efforts to connect the rivers began with Charlemagne in AD 793, but the present-day canal was only completed in 1992. You have your choice of adventures in Regensburg, famous for its beautiful, UNESCO protected old city center. “Regensburg is so beautifully situated; this region had to attract a town,” wrote Goethe in his Diary of an Italian Voyage. And attract a town it did, but not due to its beautiful location alone. Ambitious and farseeing locals built a bridge (Steinerne Brücke, or Stone Bridge) over the Danube back in the 12th century, making Regensburg an international trading hub. Because so many of the handsome buildings from that period remain, UNESCO declared the old city center a World Heritage Site in 2006. Your ship cruises through a scenic highlight of the Danube today, the Schlögener Schlinge—a hairpin loop in the Danube that was once very hazardous for ships and is now a lovely, serene stretch of water. Experience dynamic Budapest, imperial Vienna and exquisitely preserved Prague. 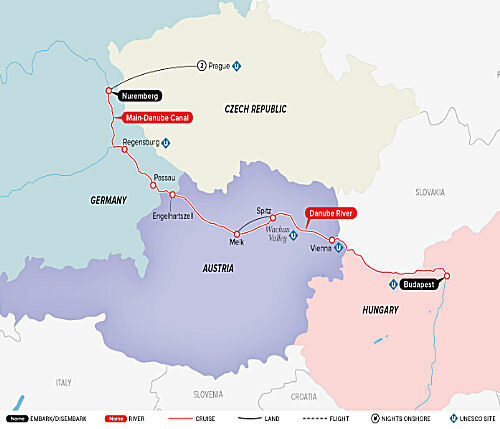 Marvel at ravishing scenery as your luxurious ship glides through the Wachau Valley, celebrated as one of the world’s most beautiful landscapes, into Germany and past charming Bavarian villages. Exclusive treasures are plentiful on this delightful journey. Go behind the scenes at a BMW factory to get an up-close view of Germany’s rich automotive heritage. This enchanting voyage provides a variety of ways to enjoy captivating destinations as well as plenty of time to relax onboard as you sail from Budapest to Nuremberg and spend two nights onshore in Prague. Who will enjoy this cruise/tour? Travelers who love history, music and architecture will be able to tailor their travel to their interests along the mighty Danube and in spectacular Prague. Share the enchantment of this region with the special young people in your life. These cruise/tours not only feature unique, fun-filled adventures for families to enjoy together, they’re also packed with culturally and historically significant experiences designed to spark creativity and lifelong learning.